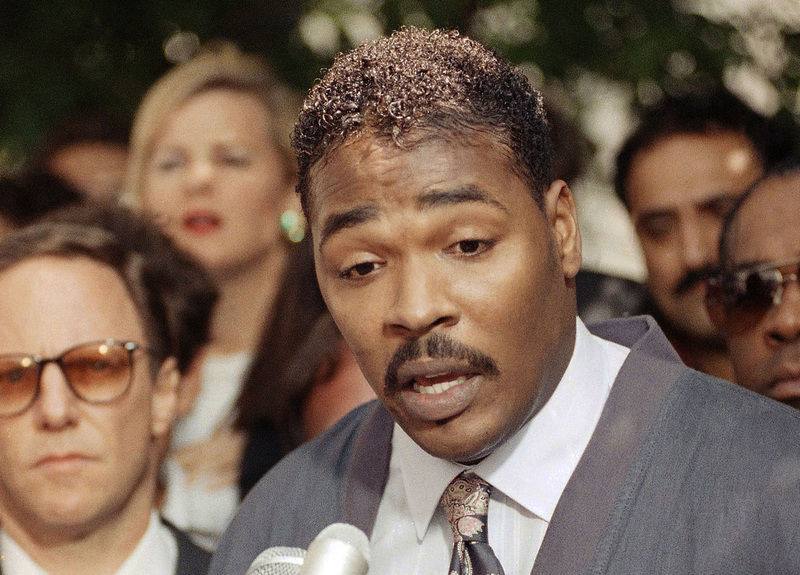 (CBS/AP) RIALTO, Calif. - Rodney King, the black motorist whose 1991 videotaped beating by Los Angeles police officers became the touchstone for one of the most destructive race riots in the nation's history, was found at the bottom of his swimming pool early Sunday and later pronounced dead. He was 47. The 1992 riots, which were set off by the acquittals of the officers who beat King, lasted three days and left 55 people dead and more than 2,000 injured. Rialto Police Capt. Randy De Anda told KNX Newsradio that about 5:25 a.m. on Sunday, the police department received a 911 call from King's fiancee who reported that he was found in the bottom of his swimming pool. "Rialto police officers responded to the location and removed him from inside of the pool and began CPR," De Anda said. "The Rialto Fire Department paramedics responded and transported Mr. King to the Arrowhead Regional Medical Center, where he was later pronounced dead at 6:11 a.m.
Capt. De Anda said King had been by the pool throughout the early morning and had been talking to his fiancee, who was inside the home at the time, adding that Rialto police are conducting a drowning investigation. Preliminary information showed no signs of foul play, he said. Investigators will await autopsy results to determine whether drugs or alcohol were involved, but De Anda said there were no alcoholic beverages or paraphernalia found near the pool. Authorities didn't identify the fiancee. King had earlier announced he was engaged to Cynthia Kelley, one of the jurors in the civil rights case that gave King $3.8 million in damages. King, a 25-year-old on parole from a robbery conviction, was stopped for speeding on a darkened street on March 3, 1991. He was on parole and had been drinking  he later said that led him to try to evade police. Four Los Angeles police officers hit him more than 50 times with their batons, kicked him and shot him with stun guns. George Holliday, a plumber, was awakened by the traffic stop outside his home and recorded the encounter with a video camera. He turned a copy over to a TV station. It was played over and over for the following year, inflaming racial tensions across the country and leading to charges against the police officers. It seemed that the videotape would be the key evidence to a guilty verdict against the officers, whose trial was moved to the predominantly white suburb of Simi Valley, Calif. Instead, on April 29, 1992, a jury with no black members acquitted three of the officers on state charges in the beating; a mistrial was declared for a fourth. Anger over the decision sparked a riot that left dozens dead and swaths of Los Angeles on fire. Violence erupted immediately, starting in South Los Angeles. Police, seemingly caught off-guard, were quickly outnumbered by rioters and retreated. As the uprising spread to the city's Koreatown area, shop owners armed themselves and engaged in running gun battles with looters. During the riots, a white truck driver named Reginald Denny was pulled by several black men from his cab and beaten almost to death. He required surgery to repair his shattered skull, reset his jaw and put one eye back into its socket. During a news conference at the time of the riots, King poignantly pleaded, "Can we all get along? Can we get along? Can we stop making it horrible for the older people and the kids?" King himself, in his recently published memoir, "The Riot Within: My Journey from Rebellion to Redemption," said FBI agents warned him a riot was expected if the officers were acquitted, and urged him to keep a low profile so as not to inflame passions. The police chief, Daryl Gates, who had been hailed as an innovator in the national law enforcement community, came under intense criticism from city officials who said officers were slow to respond to the riots, and resigned under pressure soon after. Gates died of cancer in 2010. In the two decades after he became the central figure in the riots, King was arrested several times, mostly for alcohol-related crimes, the last in Riverside Calif., last July. He later became a record company executive and a reality TV star, appearing on shows such as "Celebrity Rehab." This past spring King was on a book tour promoting his just-published memoir, "The Riot Within: My Journey From Rebellion to Redemption." In April King spoke candidly to KCBS anchor Pat Harvey about the Los Angeles riots and his life since, as well as his ability to forgive the officers. "I just felt the support throughout the world, not just here in America but the letters and the positive comments and feedback that I was getting since the beating, and people have forgiven me for some things that I've done, and so, I wouldn't be able to live with myself if I wasn't able to forgive the officers," King said. To watch Rodney King's interview with KCBS' Pat Harvey click on the video player below. Rev. Al Sharpton said in a statement that King was a symbol of the civil and anti-police brutality movement. "Through all that he had gone through with his beating and his personal demons he was never one to not call for reconciliation and for people to overcome and forgive," Sharpton wrote. "History will record that it was Rodney King's beating and his actions that made America deal with the excessive misconduct of law enforcement." Attorney Harland Braun, who represented one of the police officers, Ted Briseno, in the federal trial, said King's name would always be a part of Los Angeles history. "I always saw him as a sad figure swept up into something bigger than he was," Braun said. "He wasn't a hero or a villain. He was probably just a nice person." King's case never would have become such a symbol without the video, he said. "If there hadn't been a video there would have never been a case. In those days, you might have claimed excessive force but there would have been no way to prove it." The San Bernardino County coroner will perform an autopsy on King within 48 hours.